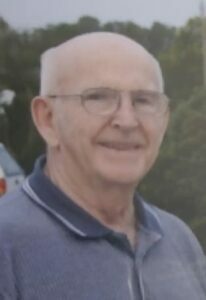 SOUTH PARIS - Leo A. Gagne, 89, of South Paris, formerly of Zephyr Hills, Fla., died early Tuesday morning, Feb. 5, 2019, at the Maine Veterans Home in South Paris. SOUTH PARIS – Leo A. Gagne, 89, of South Paris, formerly of Zephyr Hills, Fla., died early Tuesday morning, Feb. 5, 2019, at the Maine Veterans Home in South Paris. He was born on Dec. 5, 1929, in St. Patrice, Quebec, Canada, a son of, Donat and Alice (Perreault) Gagne. At a very young age, the family settled in Lewiston where Leo attended school. On Sept. 4, 1950 he married Bernadette Berube in Lewiston where they also made their home. Shortly after their marriage, Leo was drafted by the U.S. Army during the Korean conflict. He was stationed in Germany as a radio repairman. As a young man he worked in the local Lewiston mills. He settled into a career as an auto mechanic working at L&B Auto Service, Lee Auto, and Rowe Auburn. He enjoyed playing golf, his time in Florida, listening to classical music and playing cards. He will be remembered as a ferocious pinochle player. Leo is survived by his children, Marc and his wife, Marie of Oxford, Monique Thomas and her husband, James of Oxford, and Robert Gagne and his wife, Marybeth of Auburn; siblings, Jeanne Corriveau, Maurice Gagne, and Gerald Gagne all of Lewiston; grandchildren, Kristal Miller, Nicholas Gagne, Pamela Fiddler, Rebecca Stiglitz, Alan Hurd, Heather Young, and Rachel Gagne. He was predeceased by his wife, Bernadette, on March 27, 2006; sisters, Yvette Morin and Cecille Healey. The family would like to thank all those involved at the Maine Veterans Home for the exceptional care our beloved dad received. We knew he was safe and loved and that gave us great comfort. A memorial graveside service will be held this spring at a time to be announced. Arrangements are in the care of the Chandler Funeral Home & Cremation Service, 45 Main St., South Paris. Condolences and tributes may be shared atwww.chandlerfunerals.com.